Casa Santa Marta, January 13, 2016. 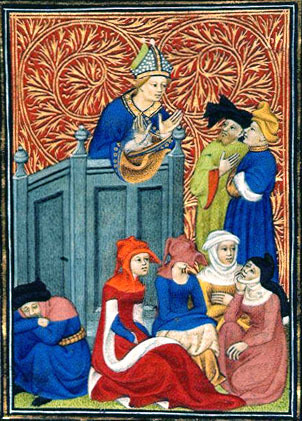 Bishop Preaching, Medieval illum. ms.
(Vatican Radio) The spirit of clericalism is an evil that is present in the Church today, Pope Francis said, and the victim of this spirit is the people, who feel discarded and abused. That was the Pope’s message in the homily at the morning Mass at the Casa Santa Marta. Among those taking part in the Mass were the members of the Council of cardinals, who are meeting with the Pope this week in Rome. In his homily, Pope Francis warned pastors of the dangers of becoming “intellectuals of religion” with a morality far from the Revelation of God. The poor and humble people who have faith in the Lord are the victims of the “intellectuals of religion,” those who are “seduced by clericalism,” who will be preceded in the Kingdom of Heaven by repentant sinners. But a law that they have remade many times: so many times, to the point that they had arrived at 500 commandments. Everything was regulated, everything! A law scientifically constructed, because this people was wise, they understood well. They made all these nuances, no? But it was a law without memory: they had forgotten the First Commandment, which God had given to our father Abraham: “Walk in my presence and be blameless.” They did not walk: they always stopped in their own convictions. They were not blameless! Judas was a traitor, he sinned gravely, eh! He sinned forcefully. But then the Gospel says, “He repented, and went to them to return the money.” And what did they do? “But you were our associate. Be calm… We have the power to forgive you for everything!” No! “Make whatever arrangement you can!” [they said.] “It’s your problem!” And they left him alone: discarded! The poor Judas, a traitor and repentant, was not welcomed by the pastors. Because these people had forgotten what it was to be a pastor. They were the intellectuals of religion, those who had the power, who advanced the catechesis of the people with a morality composed by their own intelligence and not by the revelation.